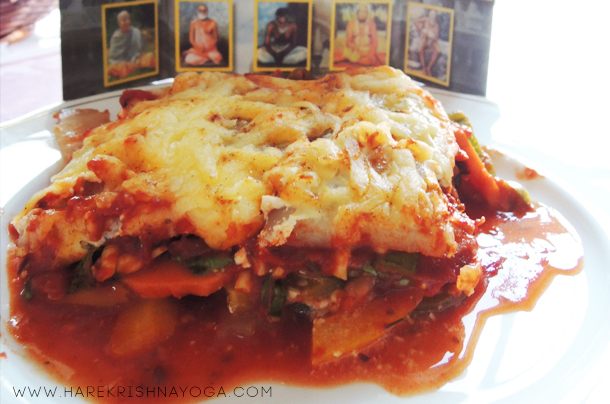 If you're fasting from grains this ekadasi, why not try this satisfying potato lasagna dish, substituting the pasta for a thin layer of potato and the béchamel sauce with sour cream. 5 medium sized potatoes, peeled thinly sliced and parboiled. 1 sweet potato, peeled thinly sliced and parboiled. Boil the potato and sweet potato slices in lightly salted water for about 5 minutes till cooked but firm. Careful not to over-cook. Heat oil in a saucepan over medium heat and when hot, add cumin, herbs, cayenne pepper and black pepper. Sauté quickly and add tomato puree. Stir in passata and add salt. Cover sauce pan and leave to simmer while preparing vegetables. Chop peppers into slices and roughly chop the spinach. Place in the top portion of preheated oven. Note: This isn't a perfect dupe for lasagna as there is no pasta to absorb the excess water from the sauce and veggies so try not to make the tomato sauce too runny. With neat layering you may be able to serve in neat little square portions with a bed of sauce however don't worry if it doesn't hold its shape, it will still taste delicious!